徐春卓, 辛颖. 宫内发育迟缓对大鼠胰腺中Ngn3表达及内分泌细胞发育的影响[J]. 中国医科大学学报, 2018, 47(10): 891-894, 899. XU Chunzhuo, XIN Ying. 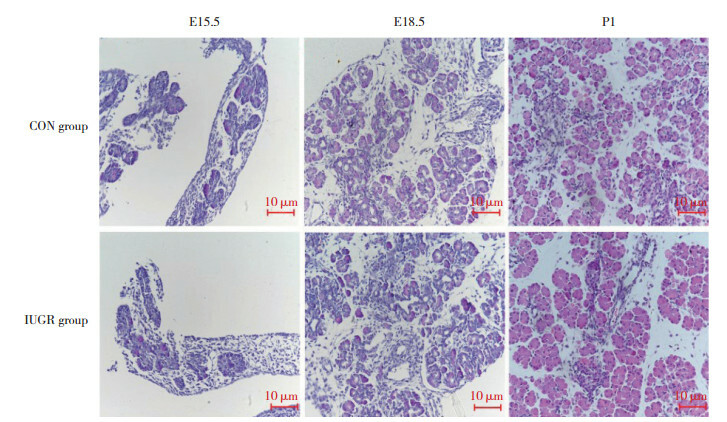 Effects of Intrauterine Growth Retardation on Ngn3 Expression and Endocrine Cell Development[J]. Journal of China Medical University, 2018, 47(10): 891-894, 899. Abstract: Objective To investigate changes in Ngn3 expression due to intrauterine growth retardation (IUGR)and its effect on endocrine cell development. Methods Pregnant rats were randomly fed a standard or low-protein diet, and offspring were labeled as CON or IUGR groups. Pancreatic tissues were collected at days 15.5, 18.5 gestation and the newborn. 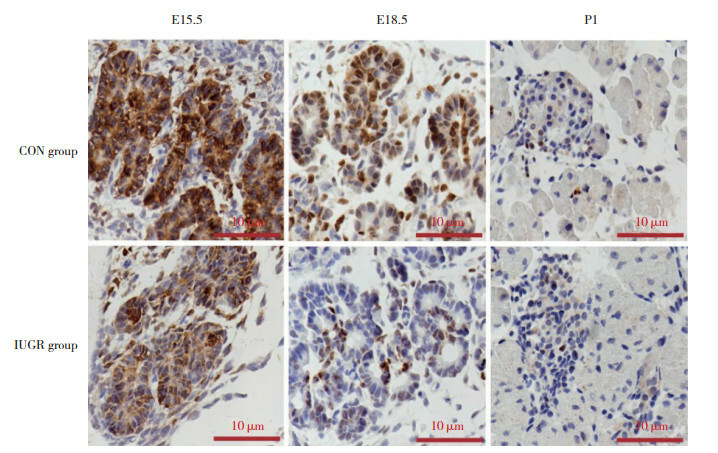 Changes in pancreatic structure were detected by HE staining, and expression of the Ngn3 protein was detected by immunohistochemical staining. Results During embryonic development, the pancreatic acinar and duct gradually formed the typical endocrine and exocrine structures. The Ngn3 protein was mainly expressed in the pancreatic duct during the embryonic period and in the islets during the newborn period. Expression of the Ngn3 protein was significantly decreased (P < 0.01). Compared to the CON group, the body weights of IUGR rats were significantly lower (P < 0.05). The number and area of pancreatic acinar, duct, and islet were lower in the IUGR group. Expression of the Ngn3 protein in the pancreas decreased, and the difference was statistically significant at E15.5 and E18.5 (P < 0.05). Conclusion Pancreatic endocrine progenitor cells were reduced, which led to endocrine cell development abnormalities induced by IUGR. 1）P < 0.05 vs the same group at E15.5 and E18.5；2）P < 0.05 vs CON group.